The "long session" of the North Carolina General Assembly gets underway this morning, and the newly energized Democrats (still in the minority but feeling feisty) came through the door loaded up and truckin'. Senate Bill 3, "An Act to Close the Medicaid Coverage Gap," was introduced by senators Ben Clark, Dan Blue, and Glady Robinson in the Senate. The identical language was filed in the NC House as HB5. Gary D. Robertson offers this forecast: "...Cooper and legislative allies seem ready to negotiate hard for expansion to cover hundreds of thousands of uninsured people .... 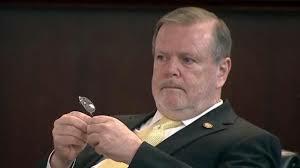 Some House Republicans support a bill that would place a work requirement on enrollees, but Senate leader Phil Berger remains unconvinced that expansion is fiscally sound." Phil Berger is wrong. Every state's experience of expanded coverage under the Affordable Care Act has been economically positive. Improved payments to small and rural hospitals, especially, with upticks in employment and economic development, have brightened the prospects of every state that's gone there (Henry J. Kaiser Family Foundation). Phil Berger could, and probably will, tank these Democratic initiatives, but he's going to have members of his own caucus squinting in his direction. The Democratic bills introduced today don't contain a work requirement for able-bodied recipients. Will Democrats fight a work requirement at the risk of losing any Medicaid gap coverage? How will Republicans want to define "able-bodied"? Will Phil Berger remain a killing frost over every attempt to better the lives of his fellow citizens?